Take off from Lyon, and make your way to the beautiful southern area of the wine-producing Beaujolais region. First, journey into the heart of a vineyard, and taste three wines and a pastry. Then, pass by the 12th-century village, Omingt, to see its medieval monuments, and end your tour at a winemaker’s estate with some more tastings on the agenda. Absolutely enjoyable. While billed as a half-day tour - we had a laid-back group and driver and ended up taking about an hour longer... something we all enjoyed. The tour was in 3 distinct parts a a drive out into the beautiful rolling hills where we stopped on a hillside near an old church and our guide gave us an introduction to local wines, b we then spent a bit over an hour just exploring the old village of Oingt, the trip was capped off with a visit to a very small, family-run, winery where we had a wonderful time tasting wine and just having a good time. We traveled in a comfortable van which held the guide and about 8 guests. One suggestion for improvement: When we went on the tour, we had absolutely zero introductions and orientation at the start. Mostly, on the drive out, we sat there in the van wondering what were in for. It wasn't until later that an orientation was given. All this company needs to do is, while still in Lyon and not yet in the van, provide an introduction to the tour's activities and agenda. Other than this one operational omission, the tour was great. 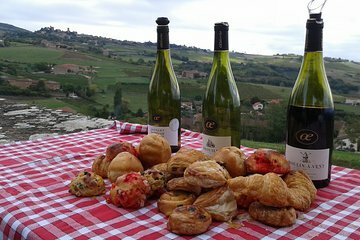 The Beaujolais gourmet wine tour with our guide Vladimir, was an excellent choice while holidaying in Lyon. He is so passionate and knowledgable about the wines and the Beaujolais region. We can highly recommend this tour with Vladimir, as he is very friendly and welcoming. Great experience from start to finish. The group is capped to only 7 people, so it is very intimate. The initial tasting helps you decipher and understand the differences in wine, particularly beaujolais. The second tasting at the vineyard was much more personal as the vintner walked you through their personal blends and spoke to how their family tends to the land. Out of a 11 day trip to Europe, this was the most memorable experience. This wine tour was amazing. Extremely informative on how to taste wine as well as the history of the region. The wine of course was amazing too. My only regret is not buying more wine at the end of the tour since it was so good and such a good price. This tour was amazing! The tour guides are lovely, knowledgeable, and very passionate about wine and the region you will travel through! 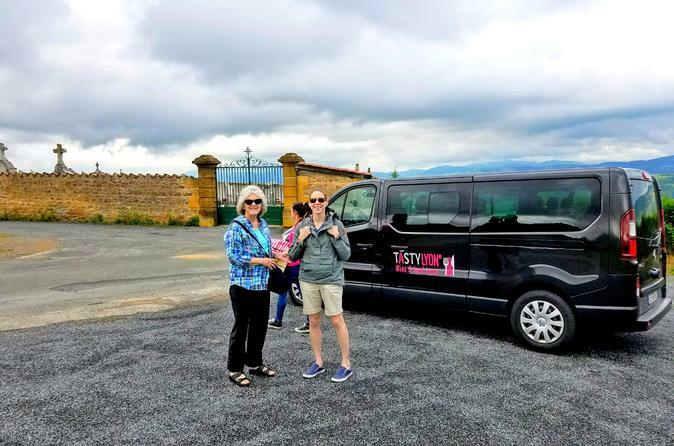 The whole experience was so easy and well thought out, simply hop in the van and see some wonderful sights and taste beautiful wine! Loved it! Thank you! Great tour from Lyon to the Beaujolais Wine Region! Driving past villages scattered along hillsides covered with vineyards. The beautiful yellow stone buildings added to the charm. We want to live here! We will remember this day every time we enjoy a glass of Beaujolais! This was a great trip. Very good value, very knowledgeable guide, loved Beaujolais. This was such a fun day. Our driver/guide was very pleasant and very well informed on the subject of wines and of the region and its history. The van was air conditioned which made the drive comfortable on what was a very hot day. The winemaker we visited gave a great presentation on his wines and provided snacks to complement the four wines we tasted. We have used Viator in the past for tours in other countries. I recommend them highly. The guide, the scenery, the vintner, the tastings - and a lively group! - all made for a marvelous and thoroughly educational excursion!! HIGHLY recommended! !